Laureen Louise Massow, age 91, formerly of Alden and Iowa Falls, Iowa passed away December 2, 2018 at the Grundy Care Center in Grundy Center, Iowa. Memorial services for Laureen Massow will be held later this spring, as she hated the winter weather and worried about friends driving. The Linn’s Funeral Home in Iowa Falls is helping the family with arrangements. Memorials can be sent to Laureen Massow Memorial; c/o Linn’s Funeral Home; 1521 Washington Ave.; Iowa Falls, IA 50126. For further information please visit linnsfuneralhome.com. Laureen Louise Kielsmeier was born the daughter of William E. and Martha [Blome] Kielsmeier on October 25, 1927, near Hubbard, Iowa. Laureen graduated from Radcliffe High School in 1945. 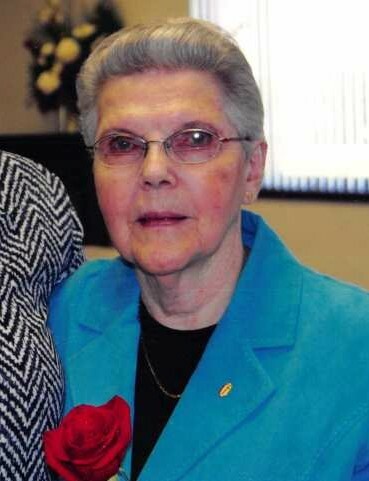 When at home, she helped with the family farm and after graduation, worked in Marshalltown, Iowa and Omaha, Nebraska, and was a telephone operator in Iowa Falls, Iowa. On December 20, 1950 Laureen was united in marriage with Donald Benhard Massow in Hubbard, Iowa. Together they farmed near Buckeye, Iowa until 1960 when they purchased the hardware store in Alden Iowa, which they named Massow Hardware, and operated for about 24 years. They then moved to Iowa Falls, Iowa. In 2012, Laureen moved to Parkersburg, Iowa to be closer to her daughter. Laureen enjoyed refinishing furniture, sewing, reading, and in the last few months, really enjoyed playing bingo. She especially enjoyed family gatherings and getting to see how much the great-grandchildren had grown. She loved her three grandsons, and their families dearly. Laureen Massow is preceded in death by her husband of 65 years, Don on December 21, 2015; her parents: William E. and Martha Kielsmeier; two brothers and sisters-in-law: Everett and Verna Kielsmeier, Marlyn and Maxine Kielsmeier; and one brother-in-law: Vern Carolus. Laureen is survived by her daughter: Sandy and her husband, John Wilmer of Parkersburg, Iowa; three grandsons: Chad [Michael Pemberton] Wilmer of Downers Grove, Illinois, Joe [Melinda] Wilmer of Cedar Falls, Iowa, and John [Melissa] Wilmer of Solon, Iowa; four great-grandchildren: Alex, Anthony, Addison, and August; and one sister-in-law: Shirley Carolus.